Striving to save his strife torn empire of Vallia from the Nine Unspeakable Curses, Dray Prescot has faced a plague of murderous werewolves and attack by the witch hordes. 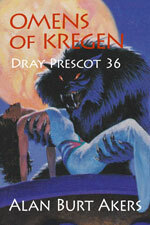 Omens of Kregen is the thirty-sixth book in the epic fifty-two book saga of Dray Prescot of Earth and of Kregen by Kenneth Bulmer, writing as Alan Burt Akers. The series continues with Warlord of Antares.